Hello Friends, It’s post wedding and I am still on cloud nine! Things went perfectly and I couldn’t be happier. One day soon I will share some pics with you here! Now onto the real reason you stopped by. 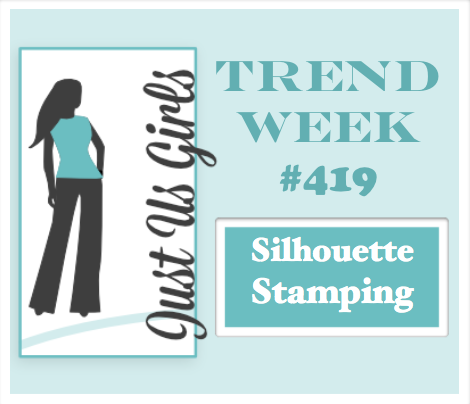 It’s Trend Week over at Just Us Girls and Lisa has asked us to try some Silhouette Stamping. Not sure my card is exactly what she had in mind now that I look at my fellow design teams cards but hopefully it will do. The background was made with my Oxide Inks and the stamp is something I picked up at Michaels …I do believe. The sentiment is my go to from Verve along with the banners. The buttons are from MFT. Categories: Cards | Tags: Card making, Cards, Happy Birthday, oxide inks, rubber stamps, stamping | Permalink. 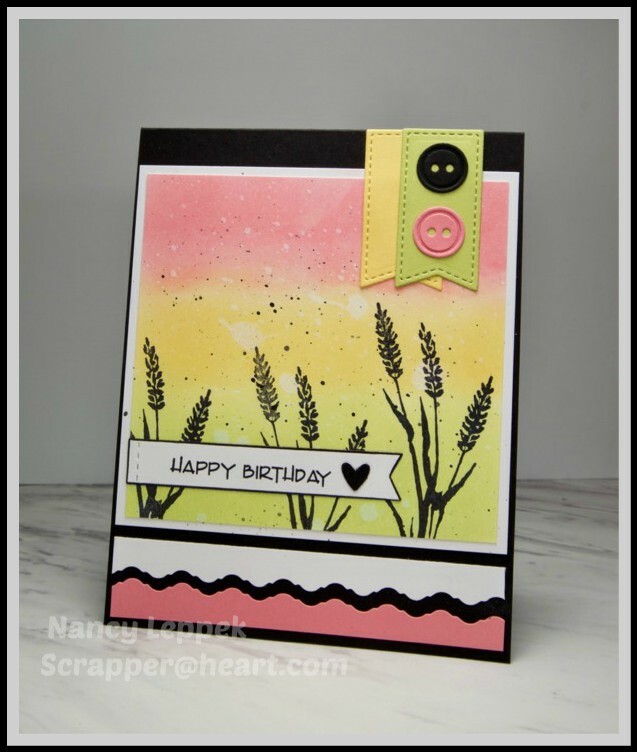 I like the sponged background that is faded into pink and yellow. It also has an art deco look with the banner on the bottom. Loving the silhouette of the ferns and the splatters. I have seen some of the lovely pictures of the wedding and look forward to more. I love this card! I think it’s the colors that are drawing me in! So pretty and feminine! Hope you are recuperating from all the festivities last week! Love seeing all the pictures! This is a cool layout and I love the sponged colors of your background. Beautiful card Nancy. Love the sponged background and the colors. Really gorgeous colors and blended so beautifully! This card really speaks to me – it’s absolutely gorgeous!!! Those wildflowers are wonderful silhouettes blowing across your beautiful inked panel, Nancy. Loving the colors and your pretty design. I think the silhouette is perfect! Nancy this is just gorgeous. Love the soft colours and the added black. Lovely layout. Beautiful! That background is blended perfectly with those gorgeous colors making a perfect backdrop for your lovely silhouettes! I think this is exactly what Lisa had in mind. This is definitely silhouette stamping. I love your colors, and the banners are the perfect final touch. Great take on the challenge, my dear!! !